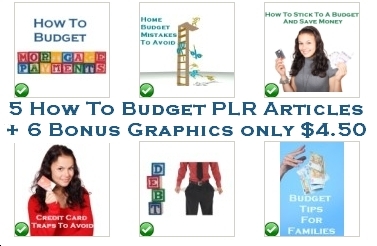 How To Budget PLR 5 x Articles Pack plus 6 Bonus meme Graphics exclusive to here – all for only $4.50 today! Having a budget is for everyone. Do not believe that having a budget means you are poor and have to plan now because you didn’t previously. The only way for people to truly understand where the money goes, is to come up with a plan and review it frequently. Budgeting is not about tightening your belt and making plans to cut down on how much you spend on the grocery store. It’s about understanding your daily amounts of money coming in and where that money is being used best. To start building out your budget plan, get a simple lined accounting book. You can buy them for a $1.00. Having the lined book will allow you to make up your own columns of what bills you have. You’ll need to gather up every paper bill or check your online banking system to see what gets paid out every month or annually if that is the way you do your property tax for instance. Also include payments for investments like mutual funds here. You want to account for all monies flowing out. The next step is to list all the money coming in. Are you a sole income earner or do you have a partner that you share expenses and salary with?